Hashim Taeeh (b.1948, Basra) is a painter based in Basra. 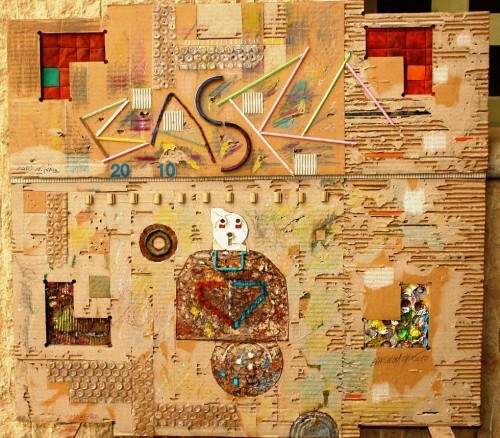 His cardboard sculptures, in collaboration with the artist Yasseen Wami, were part of Welcome to Iraq, the Iraq Pavilion exhibition at the 55th Venice Biennale in 2013. The modest material and basic, minimalist style they prefer are entirely at odds with a popular taste in Iraq for gilded home furnishings. Their ethos of “making do and getting by” – articulated with great wit – is a far cry from incongruous aspiration. 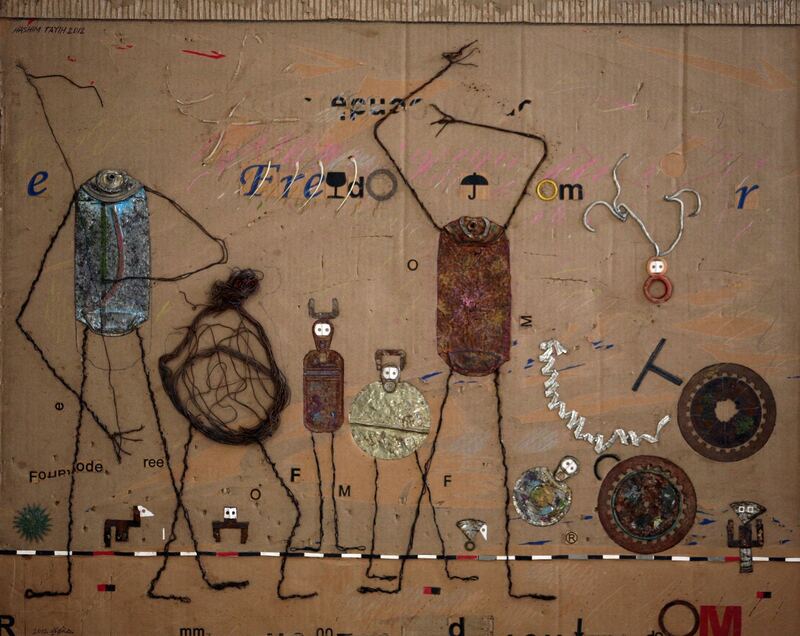 Hashim Taeeh has been working on cardboard and used materials since 1981, when the Iran-Iraq war made it difficult to get hold of paint and paper. He speaks to RUYA about his new work. Untitled, 2014. Image courtesy of Hashim Taeeh. What influenced this new series of works? Underlying the series is the temptation of colors, calligraphy, backgrounds and space. I am drawn to the language of images, there is so much energy there and potential for expression. There is the influence of public life, and the struggles of competing powers. Their attempts at disguising lies, crudeness and poverty affects me as an artist, challenging and stirring my imagination. Basra, too, has suffered serious civil and cultural decline over the decades. My past appears in my work too. I lived a life of deprivation and suppression, that fills my mind and has glided silently into my work. I was orphaned at an early age. Under the dictatorship my brother was executed for his political affiliation. I was transferred from a position in the educational sector to the agricultural sector for the same reason. In 1978, I was tortured ferociously by the former regime. What motifs are you using? Why? The works reflect daily life through a sensual combination of shapes, symbols and expressive masks. These portray the feelings and inhibitions of a human being who lives at a paradoxically tense moment in history. 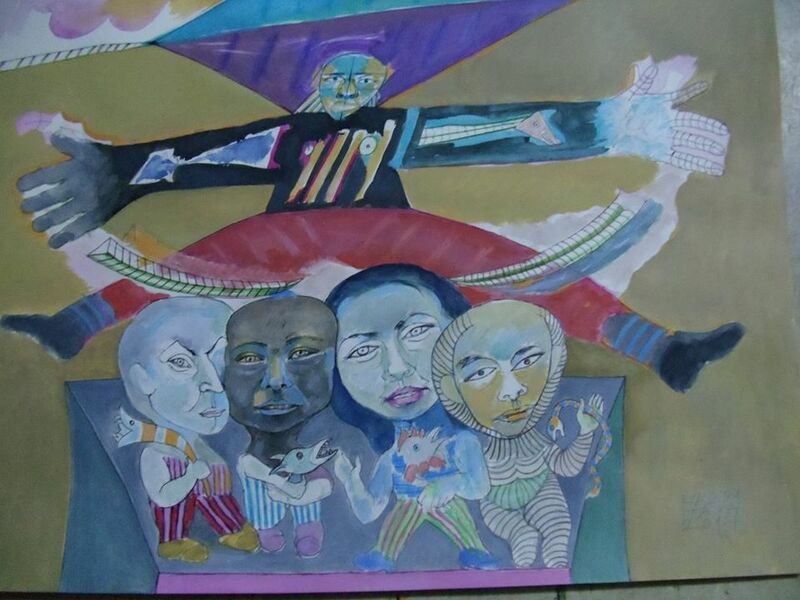 Often, my paintings have autobiographical elements, as well as a narrative. Many of these reflect on the nature of violence. It appears in the faces and masks of some of the figures. What was the first art work you ever admired? Why? My grandmother Hedida made clay sculptures of horses, using mud from a nearby stream.I was fascinated by their simple form and rudimentary materials. She lived in a simple reed house in Basra’s Nuhair al Layl. She was so immersed in her work, I could see the euphoria in her face. My grandmother Hedida made clay sculptures of horses, using mud from a nearby stream. She lived in a reed house in Basra’s Nuhair al-Layl neighbourhood. 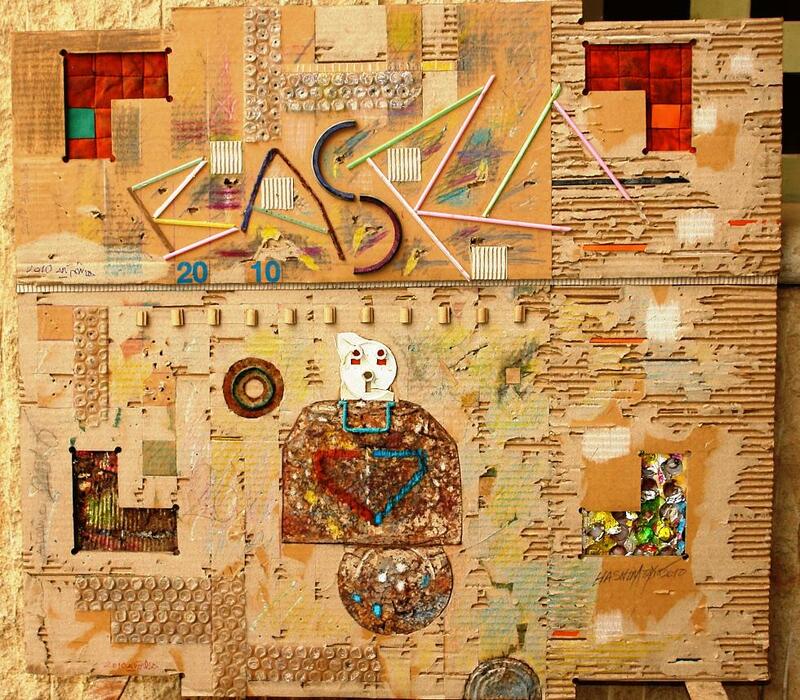 Are you able to practice and live as an artist in Basra? During the years of sanctions, I had several jobs to feed my family. I worked as an accountant for a fruit and vegetable wholesaler at night, as a worker at a drugstore, and I sold flour on the pavement. I was a calligrapher and a portrait painter at a friend’s studio, and finally a teacher during my time in Libya. Today, I work at the Agricultural Directorate of Basra, and will be retiring next year. At home, I paint and sculpt. Has the trip to Venice influenced your work at all? Venice is like a large museum. My visit, organized by RUYA, certainly influenced my recent work. I was fascinated by the magical natural setting of the city, and the Venice Biennale, which brought together different cultures and languages. The works addressed present day issues that aggrandised the Gods and diminished humans whose existence, future and destiny is subject to serious risks and dangers. Where is your favorite place in Basra, why? I like to walk along the Corniche on Shat al Arab and meditate on a bench. But Basra today is full of painful reminders. In the 1980s it became a battlefield and the frontline city for the war with Iran. This destroyed most of its landmarks and nature, like the palm orchards. Its environment became polluted by depleted uranium that caused illnesses and resulted in terminal diseases to the population. After the chaos of the regime change in 2003, Basra suffered yet another decline and deformation from the drought. Its agricultural fields were sold to big petroleum companies. Palm orchards were destroyed to make room for housing projects. The local authorities failed to adopt a policy against this, and ruined the city. For more images, or information about Hashim Taeeh’s work, please contact [email protected] .